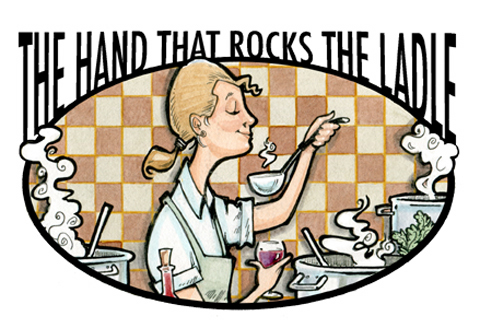 I was asked to illustrate this website banner for Elizabeth R. She regales her readers with tales of recipes conquered and taste buds thrilled; all for the edification of those brave souls who take spatulas and cooking thermometers in hand. Is the hand that rules the world! John, nice play on an old saying! And including that glass of wine was a nice touch! Elizabeth came up with a real winner. Thanks for the nice word. I enjoy helping along bloggers when what they have to offer is a real treat. This page contains a single entry from the blog posted on July 1, 2012 12:25 AM.